I constantly hear SEOs and internet marketers evangelizing good content, suggesting that brands "create high quality content," or "build link-worthy content." Content has definitely become a trend word, with many people, including Bill Gates, proclaiming "content is king." So, I'm going to break down steps to creating high quality written content. I'm focusing on written content, because that's what I see brands trying to create most often—but obviously there are many types of web content. Unfortunately, many brands try to start writing web content before they identify why they’re writing it, and what purpose it will serve their readers. What questions are your readers asking and what topics would they like to see covered? Identify and develop your topic: Once you evaluate what your readers want and need, narrow down the specific topic you wish to cover and flesh out the finer points. Review what’s already been said: Delve into what industry experts say on this topic--which will provide you with the backbone of your research. Identify gaps: Once you figure out what’s already been said on the topic, identify what hasn’t been said. Great content is useful and unique. If you want to contribute something unique, then you need to make sure what you’re writing hasn’t already been said. Many brands, bloggers, and web writers make the mistake of writing for the web like they’re writing an essay, but web writing is not like academic writing. 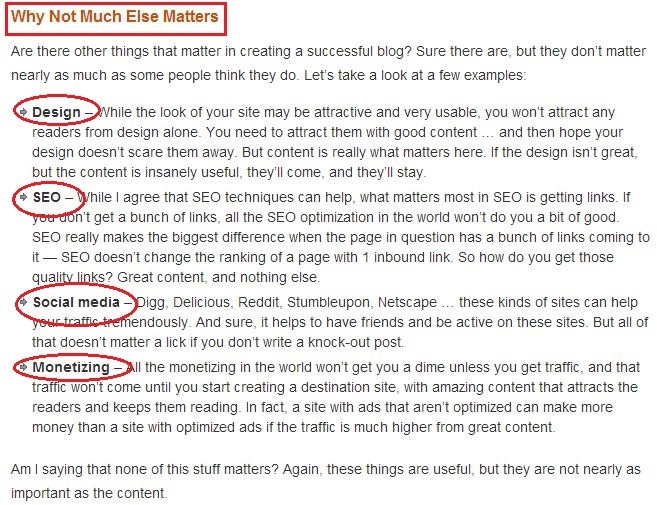 There are a whole set of best practices that apply to web writing. As we all know, anyone can write anything they want on the internet, which is why 65% of web readers find web content “hit or miss” or “unreliable,” according to a study conducted by content strategy company, Content Science. If you’re going to post content online with the hope of people taking you seriously, then you need to qualify yourself appropriately and create credibility. 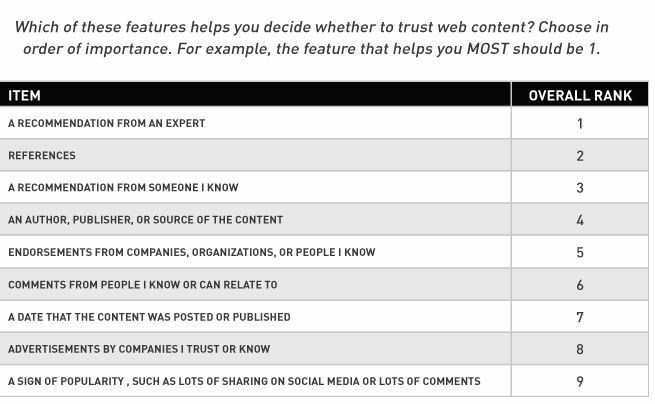 But, as a brand, web readers are less inclined to trust your content--with endorsements from companies/brands ranking 5th in features that help readers decide whether or not to trust web content, according to the same study referenced above. If you want to build credibility, you need to write unbiased and non promotional content (if people wanted to hear more about your products, they would would refer to your ads). Web readers are hypersensitive to brands trying to sell them something or endorse a particular product. Like I said earlier, great web content is both unique and useful. The nature of the internet lends itself to web readers hunting for solutions, and they’re looking for actionable content that they can use--the more practical your tips, the better. For example, it’s not enough to say that the keys to losing weight are eating less and doing more yoga. Those are both difficult things to do, so if you want to create a resource, you need to give readers extremely useful and practical ways of doing those things. 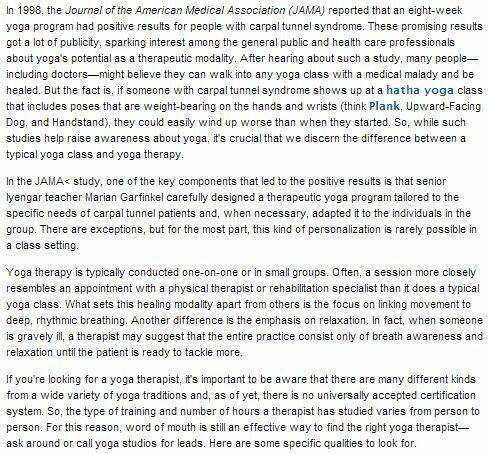 Take a look at the actionable yoga content versus non-actionable yoga content below--you will see that the actionable example has clear step-by-step directions (plus a picture) as to what the reader should do to achieve the end results. The non-actionable example doesn’t give the reader any takeaways. Tons of people on the internet write about their experiences and observations, but in order for your content to be actionable (and thus, relevant), you need to give your readers something to do with the information you give them. Are there clear takeaways or points of action readers can get from your content? Are there steps explaining how to do something or where to find more information? Does every section of your writing add value to your desired message? A web audience, unlike an academic audience, will expect you to use a conversational tone. While some larger, corporate blogs (Forbes, for example) will still stick to a more business-professional voice, overall readers will expect a more informal tone. Also, make sure to avoid flowery or overdone language. That said, while you’re writing on the internet, that is not an excuse to throw out all grammatical rules. Quite the opposite, in fact-- readers will immediately think your content and brand lack credibility if you have awful grammar or spelling. 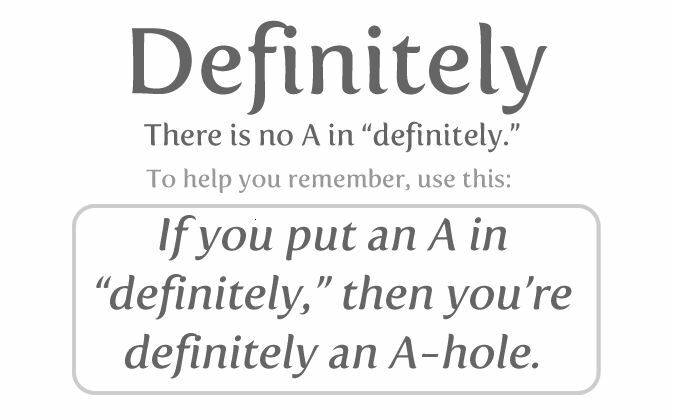 If you need some spelling help, The Oatmeal has a great place for you to start. As you can see in the examples below, the scannable content is broken up with a subheading, a bulleted list, short paragraphs, and bolded words. 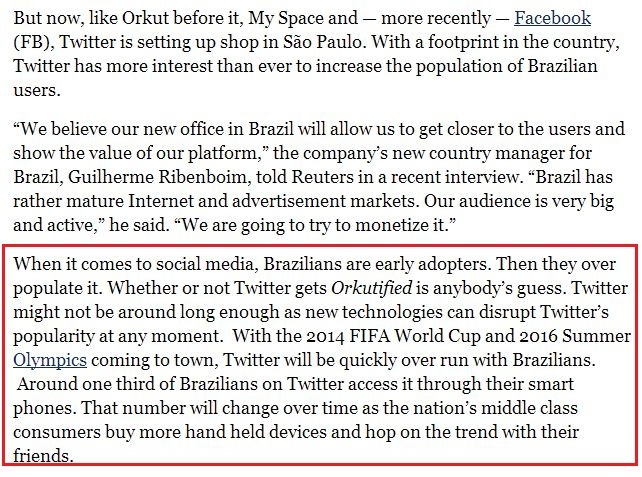 However, the unscannable example has large blocks of text (especially the last paragraph boxed in red), no lists, bolded words, etc. If you’ve done the work to craft a well written and well researched article, take the take to make it scannable, so you readers are more likely to actually read your content. Despite all the blogs claiming to have the recipe for the perfect article, web writing is a new medium and it’s not an exact science, so keep your methodology and practices agile and flexible.